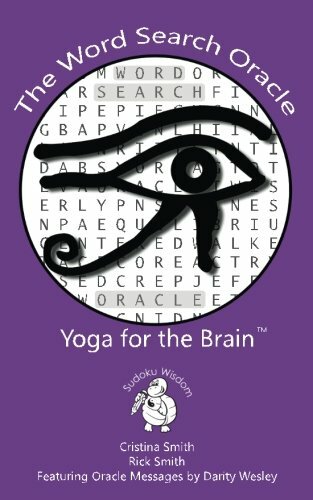 “The Word Search Oracle: Yoga for the Brain,” by Cristina Smith and Rick Smith, featuring oracle messages by Darity Wesley, is Book 2 in the Sudoku Wisdom Series. The series is unique in approach by incorporating philosophy into an entertaining, challenging puzzle book. Having previously read and reviewed “The Tao of Sudoku: Yoga for the Brain,” I was excited to get my hands on this next edition. The book starts with the definition of an Oracle and how we can use the messages in the puzzles to delve deeper and create or expand a mindful spiritual practice and greater awareness of oneself. Each puzzle presents a focused theme (i.e., Connection, Gratitude, Purpose, Forgiveness), with a short paragraph of reflection on the subject, the word search puzzle itself, and a secret message revealed at the end by using the letters left-over after the word search is finished. The secret message presents in the form of a mantra or positive affirmation, which are helpful tools for building a positive mental attitude and outlook. Mixed in throughout the puzzles are pages that present interesting facts about our eyes, the brain, the practice of mental yoga and the benefits to our general well-being. There are also some great tips for solving the puzzles, using some techniques I had not considered before. I am partial to word search puzzles. I’ve been doing them since I was a young girl, usually timing myself, and creating a competitive atmosphere. “The Word Search Oracle: Yoga for the Brain,” challenged me to incorporate a different attitude and approach; to slow down and consider the individual puzzles as part of a conscious spiritual experience. With that in mind, I tried to develop a (somewhat) consistent routine, typically at the end of the day, when I was ready to unwind and still my mind. That said, while I did try to stick to my nightly routine, there were times when I couldn’t help myself and rushed through a puzzle because I was eager to reveal the mantra on topic matters that really struck a chord with me. Gratefully, this book teaches there is no wrong way to solve the puzzle, and I learned a lot about myself during the process. I subscribe to a daily online crossword puzzle where users’ completion times are tracked. After reading this book, I realize there is a lot of unnecessary stress created with timing yourself. My experience with “The Word Search Oracle: Yoga for the Brain,” by Cristina Smith, Rick Smith, and Darity Wesley has taught me that life (and puzzle solving) can be much more pleasant when you slow things down a bit! I highly recommend this book for puzzle gurus and those who want to develop or enhance their spiritual practice.